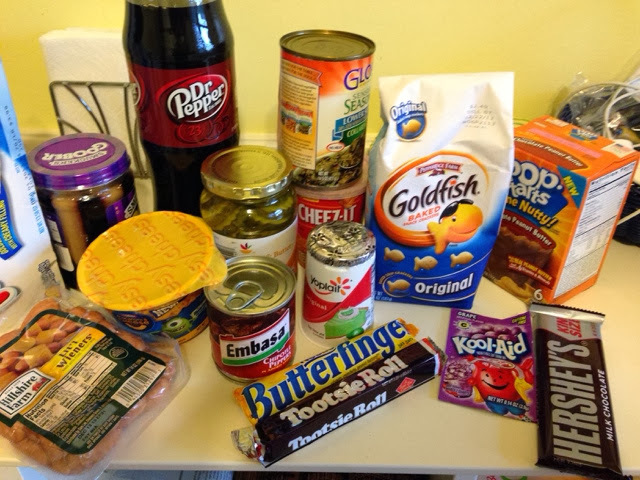 We bought some of what we considered quintessentially American food and drink. Some of this you can find in Australia, like Hershey's chocolate, but none of the kids had ever had any of it. Then we had a tasting session. Would willingly eat again : the wieners, the goldfish crackers, butterfinger, pop-tarts. Would eat again to be polite : tootsie roll, Hershey's chocolate, Kool aid, cheezits. Would never eat again: collard greens, chipotle peppers, goobers peanut butter and jelly (all in one jar), key lime pie flavoured yoghurt, twinkies (that surprised me, Lily wouldn't even try hers), Dr Pepper (like medicine with fizz in it), instant Mac'nCheese, dill pickles. I read a blog written by an American woman who had relocated to Australia and she bemoaned how tasteless she found the food in Australia. We are finding a lot of things are much sweeter or saltier (or both) than we are used to and I guess if you grow up with that as default Australian food might well be comparatively bland. We are constantly surprised at how many things can be combined with peanut butter - icecream, muffins, donuts, cupcakes, cookies - you name it and you'll find a peanut butter combo. In fact multiple flavour options generally seem to be popular. Red velvet coffee. 'Moose tracks' milkshakes (chocolate bits and marshmallows). Pumpkin spice icecream. I'll let you know the feedback if we sample any of these more exotic varieties. So far the brownie batter icecream with a scoop of mini freckles stumped even sweet-tooth-Ruby. I'm a fan of Hershey's with almonds, but I am told all the time by my husband that its not real chocolate.